Shanna came to Baxter Creek Vet in June of 2013. She is originally from Kent, Ohio. She started working in the veterinary field as an assistant in 2000 and earned her degree in Veterinary Technology in 2006. During her college years, Shanna worked summers in Yellowstone National Park and discovered a great love of this area and decided to work towards moving here permanently. In her free time she enjoys hiking, camping, paddle boarding, and skiing. ​Melinda developed an early love of animals growing up in rural Pennsylvania. After graduating from Gannon University with a degree in Marketing, she and her husband John moved to Montana in 1989. 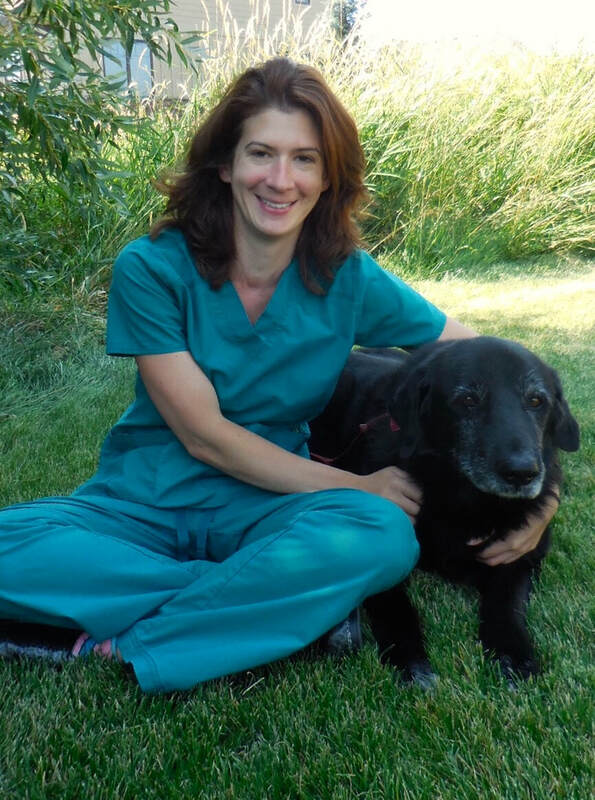 Melinda has been working in the veterinary field since 1994, and is excited to be part of the Baxter Creek family. She enjoys spending time with family & friends, biking, and cross country skiing . Jessie came to Baxter Creek in July of 2017. She worked as a kennel technician at a veterinary clinic for three years after school, then decided it was time for a change of pace. After a few years, and a few different jobs, she realized it was time to be back in a veterinary clinic. When not at work, Jessie volunteers with Tiny Tails K9 Rescue, and enjoys reading, camping, hiking, four-wheeling, and horseback riding. She also likes to spend time training her border collie cross Luna. ​Amber was born and raised in Bozeman, and has worked in the animal care field for the past four years. Starting at Heart of the Valley Animal Shelter in 2013, she expanded her knowledge and love for animals. It was during her time at Heart of the Valley that she acquired her naughty heeler cross named Ray, and adorable kitty named Vince the Prince. Since then, she has gone on to be a veterinary assistant with another clinic and is now very happy to be a part of the Baxter Creek family. In her spare time, Amber enjoys traveling, camping, hiking, fishing, and spending time with friends. Michelle is our newest member of the Baxter Creek family. Raised on a farm in rural Cedarville, California she grew up with a love for all animals, big and small. She first came to Montana to work summers as a wrangler at the Lone MT Ranch in Big Sky Montana. Falling in love with the state she moved to Belgrade in June 2016. Her beloved cat Nami rules with sass and a love for feathers. When not at work she is usually found outside enjoying the beauty of Montana or inside curled up with the cat and a book. ​Alyssa is originally from the San Diego area and moved to Montana in 2012. She earned her Bachelor’s Degree in Animal Science from MSU in May of 2016. She has an extensive background with horses, from showing them competitively to using them for ranch work. Alyssa has a Palomino Quarter Horse named Boone, as well as two Boston Terriers, Mac and Rocco. When she has some time to spare, Alyssa enjoys riding Boone, playing with her dogs, and exploring all that Montana has to offer. ​Ali joined the Baxter Creek team after she moved to Bozeman from Washington State where she worked as a veterinary technician for 2 years on the Olympic Peninsula. She attended California State University Chico and spent her summers during college working in both Yellowstone and Grand Teton National Parks. Caring for animals has always been a major part of Ali's life. Growing up she raised livestock animals for 4-H and FFA, and bred and trained Labradors as service dogs for children on the autism spectrum. She enjoys spending her free time hiking and camping with her two dogs, Sequoia and Captain. Beth was born and raised in Bozeman. She joined our team in May of 2012, after her time working at Heart of the Valley animal shelter helped her discover a passion for animal care. She graduated from MSU in the fall of 2015 with a degree in German Studies and minor in Japanese Studies. Beth has an 14-year-old Eskimo/Shiba Inu mix named Harley. When she's not at work Beth enjoys reading, being outdoors with her friends, and traveling. ​​Bekah returned to our team in June 2018 after spending 2 years in Portland, Maine. She brings with her 10 years of experience in the veterinary field and is very excited to be back with the team at Baxter Creek. She now resides in Bozeman with her two cats, Tiny and Butter, and her newly adopted Chihuahua, Bernard. ​Sara originally is from Elkton, Maryland and moved to Montana in December of 2017. She completed her large animal science degree from Delaware Valley University and is pursuing a bio engineering degree at MSU. She comes with extensive knowledge after being raised on a beef and dairy farm. In her free time she enjoys hunting, fishing and running. Vicki joined Baxter Creek Veterinary Clinic in May 2013, having worked the previous five years at a vet clinic in Southern California. She is a big fan of local rodeos and the PBR (bull riding that is, not the beer!). She and her Boston Terrier Zelda are really enjoying the quiet, wide open spaces of Montana.